Healer Blackthorn knows all too well the rules of her bond to the fey: seek no vengeance, help any who ask, do only good. But after the recent ordeal she and her companion, Grim, have suffered, she knows she cannot let go of her quest to bring justice to the man who ruined her life. I believe this situation calls for a “YAAAASSS” of epic proportions. In less than a year, Juliet Marillier has become one of my favourite authors and her books are always an automatic purchase for me, but the Blackthorn & Grim series has a special place in my heart. 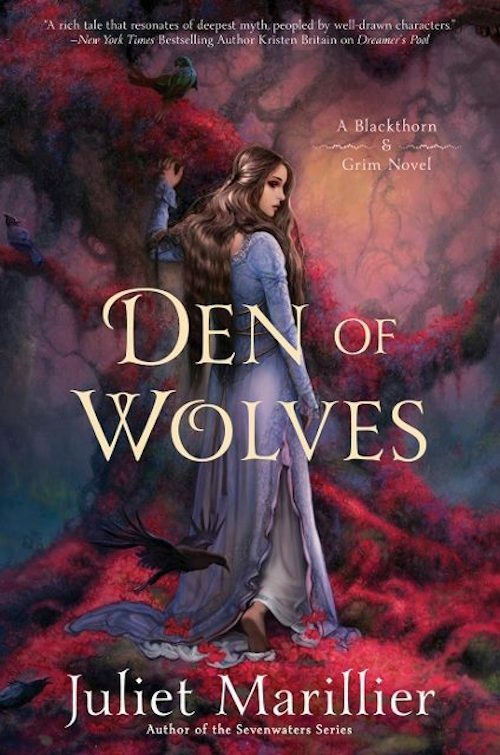 And after the emotional turmoil of the last book, I anticipate that DEN OF WOLVES will break my heart and then put it back together again. According to this blog post, Juliet Marillier has been contracted for three novels in the series but hopes to carry on after that. So DEN OF WOLVES has to act as both a conclusion and a jumping-off point for more adventures. Fingers crossed that her contract gets extended, because I could read about Blackthorn & Grim forever! YES!!! NEED!!! I was actually going to do this one this week, and forgot. Amazing pick! I died when I saw that the cover had been released! It’s only been a few months since I read TOWER OF THORNS but I’m already clamouring for more of Blackthorn & Grim! Eep, I can’t wait! I really hope she writes more, because I agree, I could read about Blackthorn and Grim forever. Same! Although I do worry about them. Marillier is a fantastic author but she’s not always kind to her characters…and poor B & G have been through so much already. I have a silly hope that they’ll be allowed to have some happiness should the series progress past the third book, but i know it’s unlikely, haha. Oh no, I’m sorry! /o I do think it looks pretty, too. I mean, those colors. *__* This whole series has the best covers! These covers just get prettier with every books omg, I want to hug it to my chest. I want this series to explode and go on forever like the Sevenwaters one did. YES! I’m really happy that she’s getting good cover art. Juliet Marillier should just write always, and never let her poor characters be happy, haha. But seriously though, I would read 10 B & G books easily. I sure do hope there will be more in this series than three books! I’m holding out for five. Five is a good, strong number, and not so high that the series will get unwieldy. Fingers crossed! I’m always interested in the books you feature in these posts and it’s just making me realise I really need to read some Juliet Marillier books. I think this every time I see any posts featuring her books and then proceed to not buy them. They look so interesting and knowing this is one wraps up one story arc is a perfect excuse to binge read it. Even if this is just the ending to one trilogy, that’s a perfect time to start reading right? YES! NOBODY PANIC! Becky’s going to read some Marillier, people!!! Hahaha. <— I am excited about this. Honestly, I don't know if I ever would have heard of Juliet Marillier without getting into blogging. Her books are so painful and heart-wrenching yet still beautiful and hopeful somehow. I hope that I (and all the other bloggers who love her) haven't hyped her up too much, and that you end up loving her books! Dreamer's Pool, the first Blackthorn & Grim book, is a great place to start with her work. I know, right? Everyone needs to chill, it’s a completely normal situation. I’m just a girl going to read another book. I am exactly the same, I had never heard of her and then there was a whole new world of books opened to me when I started blogging. It’s good, but my shelves and my bank balance are not completely grateful. And this is good, it’s great to know the best place to start. I will avoid all hype and just get reading. I haven’t heard too much about her books, or no more than most books I’ve bought before, anyway. I’ll let you know how it goes. I hadn’t seen the cover for this book and I love it. I can’t wait for this book either! I think the cover kind of looks like a fancy art print you’d find on etsy! Gorgeous colours. The wait for November 2016 is going to be long but I’m sure it’ll be well worth it! I have to read No.2 – very soon!! The covers for these books are so gorgeous. I want them as posters! I am cringing as I write this, but I have not yet started this series…but this beautiful cover is getting me fired up to start it soon!